Osama Bin Laden is Dead, So What? It is interesting that the media has changed so much. In 2001, it was the TV that brought us the shock of 9/11. Today, in 2011, it was the Internet. 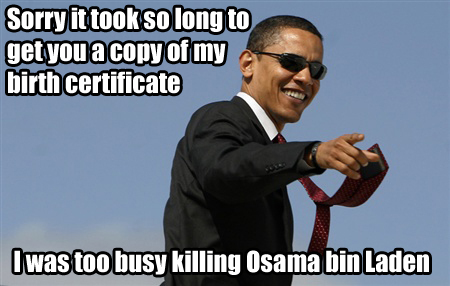 The Internet told us Osama Bin Laden is dead. I didn’t originally want to blog about this. But when I attempted to type up a short Facebook status, I found it would just be repeating what pages and pages of news feed said. So it would be time to write my first blog post in a month. Back on September 11, 2001, it was a normal day of 4th grade at Laurel Mountain Elementary School, when my teacher told the class about what had just occurred. To be honest, I was confused at first. The teacher said that terrorists had hijacked passenger planes and used them to demolish the twin towers. I was thinking, don’t you need a military plane to do that? Why would passenger planes be armed with missiles? Not until later in the day did it occur to me that the planes themselves were the missiles. I probably didn’t think this at the time, but it’s pretty scary if the enemy is willing to destroy themselves to destroy others, to destroy innocent civilians, and more relevantly, to destroy us. And here we are today, learning that the man behind those attacks is dead, killed by American forces. The first thing that comes to mind is a sense of long-awaited relief, that with one small step, we accomplished a giant leap for national and international security. That’s probably how want to think of it. We’d like to think that the threat of terrorism has greatly subsided, or even disappeared. We would like it if this one event could cleanse the world of war and violence. Yet that is far from the case. Terrorism will continue, though likely not in full force. And given that it took nearly ten years to eliminate Osama Bin Laden, it is clear that we face a stubborn resistance, a dare-I-say tenacious resistance. America and the rest of the world need to be remain tenacious still. The last thing we want to do, seeing what has happened today, is to start celebrating thinking that this is over. It’s not. Now I’m not saying this is an unimportant event. Of course it’s important. Even if we are unsure about the real consequences, it certainly is a psychological victory. So cheer up. Raise a flag. Show them who we really are. Well, that’s probably not the right place for today, but you know what I mean. Yes, you would link that. I think it’s only as important as was the threat of possible terror attacks that he was going to organize/carry out.